We make cocktails. You know that. 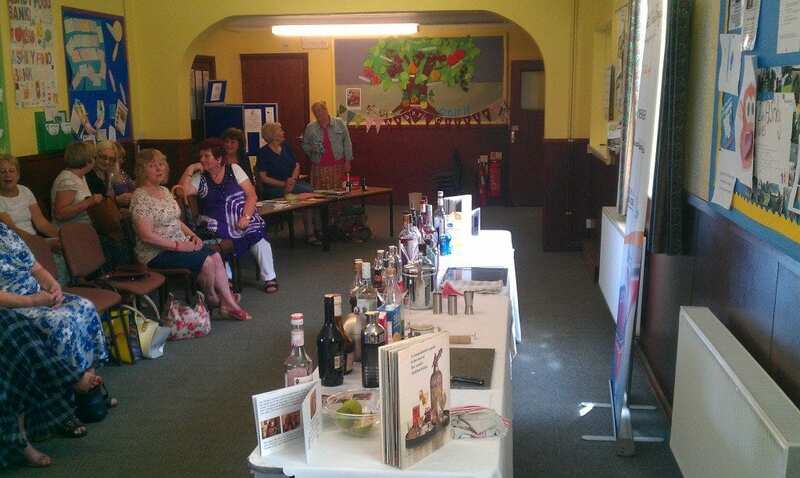 But we also talk about cocktails and turn that into a cocktail making demonstration with samples supplied afterwards. We know how to win over an audience! Supply them with cocktail samples. Easy really! To date we have provided our 40 minute talk ‘Everything you wanted to know about cocktails but were afraid to ask’ to over 40 W.I. groups across the Midlands, mainly Leicestershire and Northamptonshire. Now we’re getting known in Buckinghamshire and Warwickshire too. We’ve also spoken at the Rotary, and to a Tangent group. We’re talking to 2 companies about providing a talk as part of corporate events. They want something non-work related and “a bit different” for their staff. A lively presentation – to entertain and inspire! We ensure that the presentation is lively and there is the odd bit of banter thrown in for good measure too of course. We’ll talk about how to structure your own cocktails if you want to try your hand at a bit of mixology. We explain the colourful history behind spirits, liqueurs and cocktails. Plus we bring along a great range of ingredients for you to look at, ask us questions about and sometimes even sample. Towards the end of the presentation of course – the bit everyone has been waiting for. The chance to sample from a selection of 2 cocktails and 2 mocktails. We appreciate not everyone drinks. For drivers having some alcohol-free offerings is important of course. However these are only samples. We’re aiming to entertain you and engage you, not get you blind drunk! That wouldn’t look good for any of us. If you want to find out more about what we could offer you and your group as guest speakers, then please let us know by dropping us a note to fun@cocktailshakerboys.co.uk or by phone on 01858 898154. We provide cocktail making demonstrations around the area including Leicester, Kibworth, Market Harborough, Northampton, Kettering, Wellingborough, Oakham, Rutland and all over Leicestershire, Northamptonshire and bordering counties. Cocktail presentations for the W.I. Cocktail presentation at the W.I.